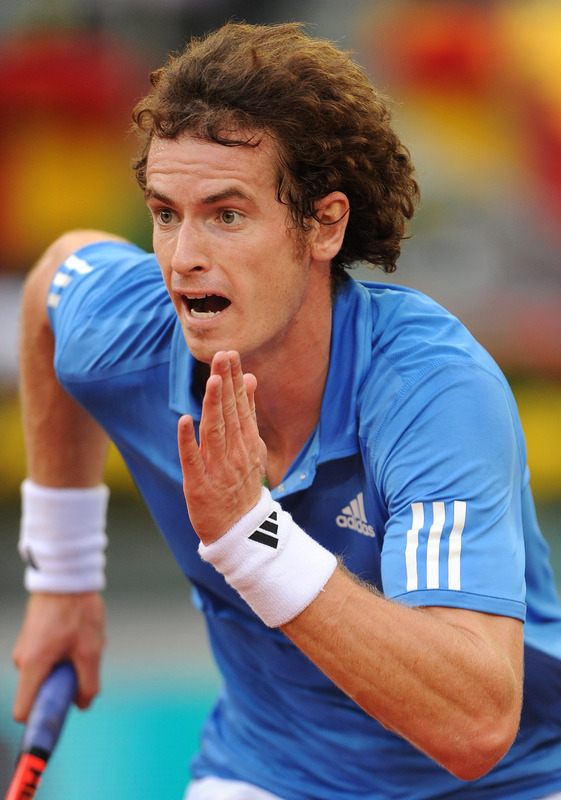 [We invited the] Road Tennis Association of Barbados to London, to teach Murray how to play Road Tennis. A cross between traditional tennis and table tennis, Road Tennis is played on the street, with participants chalking out their own courts. Murray had never played the game before, and was given just one hour to pick up his wooden bat and attempt to master the game’s ins and outs, before we put him up against Barbados’ finest. In the video above, Murray gets a “warm-up” with storied English boxer David Haye, who is now retired, and British rapper Example. adidas noted that the Murray vid was the first of many to come for the brand over the next year: “The event marked the start of our new campaign, where we’ll be challenging some of the world’s best tennis players, around the biggest tournaments next year.” Excited? You bet we are! As for who Murray gets a lesson from on the Road Tennis pavement? That’d be Sylvain “Lama” Barnett, a legend in Barbados and one of the Pro Road Tennis Association’s greatest players of all time. Testosterone treatment: The folks at adidas have done well to integrate current streetwear trends — geometric patterns, color blocking, neons — into their men’s adiZero collection. 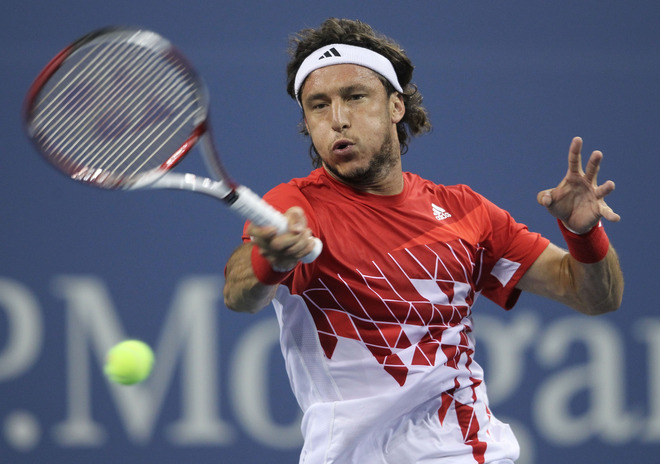 As a whole, this was the best look for the 2011 U.S. Open, seen on Juan Monaco, Jo-Wilfried Tsonga, Fernando Verdasco, Alexandr Dolgopolov, among others. Over at Styleist, we point out a few U.S. Open fashion notables to the casual tennis fan: the neon Polo Ralph Lauren ballperson polos; Sharapova‘s Head bag (it’s true: we can’t stop raving about it); Galina Voskoboeva‘s ruffled dress from Ellesse (trust: it wouldn’t have made this list had it been worn by Nadia); Lacoste‘s color blocking for both men and women; and adidas‘ men’s adiZero line — all those triangle patterns are to die for! What do you think? Was there something else we should have mentioned? Read: “U.S. 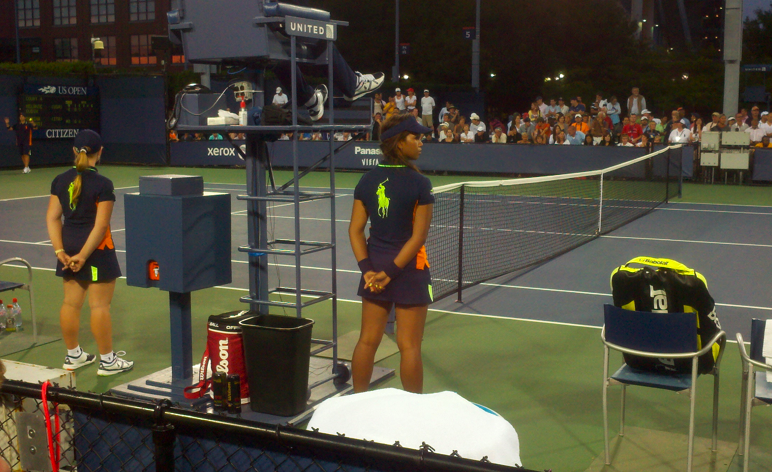 Open Tennis Fashions: What You Don’t See On TV,” styleist.com. Sleek: Wozniacki’s wearing a white chalk dress — scuba-inspired — from adidas by Stella McCartney. Check out this video from her photo shoot for the fall pieces. The gallery below also shows the photos released as part of the lookbook for the collection. 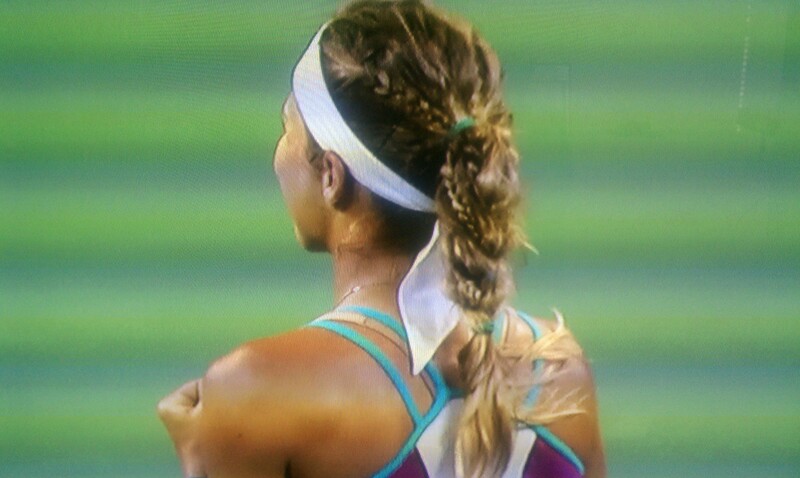 The details: Maria did everything a little better than McHale on the court, including with their outfits. The Russian’s clothes, from this season’s adidas Barricade line, include “Intense Blue” and “Intense Pink” as its colors. Sprinkle some gold jewelry, a dark nail color, a few wristbands, some braids within braids (! ), purple laces on white/yellow on her shoes, and a slouchy dark fuschia bag to bring on the court. Perf. 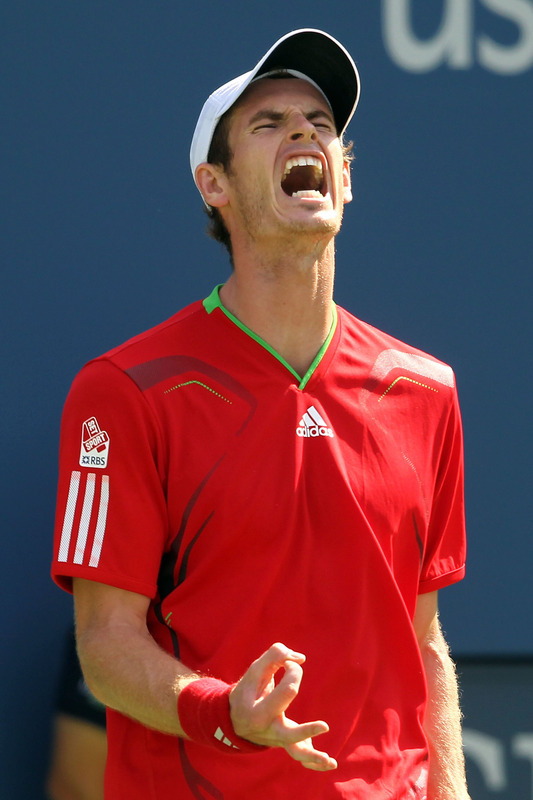 Draw: The fourth-seeded Murray defeated Somdev Devvarman 7-6 (5), 6-2, 6-3 and will next play Robin Haase. They’re both in that bottom half of the men’s draw along with Rafael Nadal. Attention to detail. We had to tell this ball girl yesterday that we just loved her nails. Loved! While lots of the bright colors at this year’s USO are coming from full-fledged kits — particularly adidas — if you look closely, this gal took subtle brightness to another level, using neon yellow on her fingernails to go along with her Polo Ralph Lauren top. We dig it. Neon-plosion. In fact, it’s actually very hard to tell just how bright a lot of these clothing items actually are. 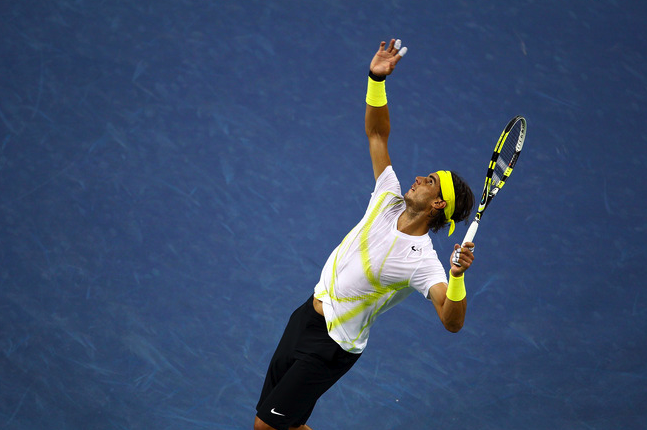 Rafael Nadal’s Nike is blindingly yellow, though both TV and still cameras dumb it down a little. 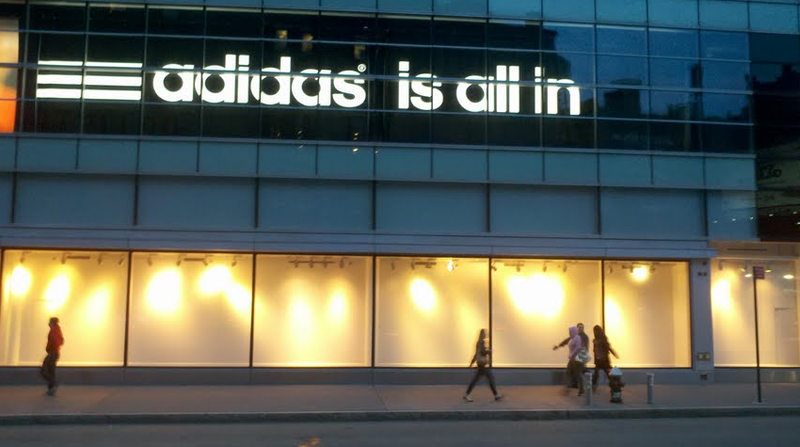 The same goes for the tones of bright reds, pinks and oranges that adidas is experimenting with. 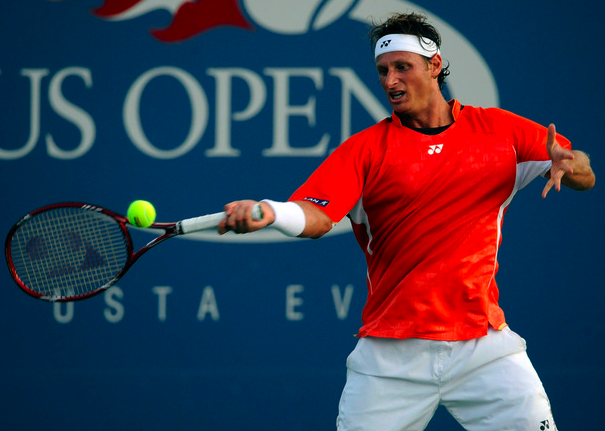 Below: David Nalbandian. As Nick noted in a tweet yesterday, Wilson is doing the same thing, though they are going more of the Nike route (accents) than adidas (full color blocking/in-your-face patterns). Which do you prefer? Below, a good shot of the adidas kit that Sania Mirza had on today — similar to the bright number that Christina McHale rocked yesterday — both on the new Court 17. And don’t forget that this all comes back to PRL, too. Their ball persons are in the same fashion game as the players. Anyone noticing a trend?! 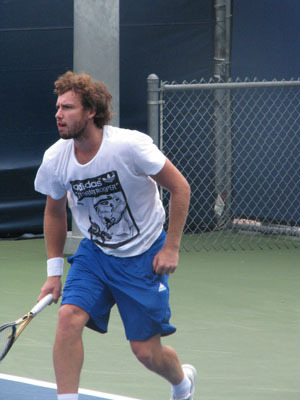 Facing Fish: Ernie Gulbis hits with Canas a few hours before his final match against Mardy Fish at the Farmers Classic, being contested this week at UCLA. This is Gulbis’ second appearance in an ATP World Tour final; his first was at Delray Beach last year, where he won his first career title. Bracket: See how the men fared in Los Angeles. What a trooper: Browse the goods from the Fall/Winter 2011 adidas Originals x Star Wars collaboration here (and grab the goods here. Our fave? The Flight Jacket and the AT-AT sweatshirt. Tri, tri again? With this look, more is less. We actually love adidas’ over-use of the triangle on this adiZero Feather top seen on Thomaz Bellucci at the Farmers Classic in LA. Yes, there are plenty of triangles on the shirt itself, but the design is broken up by the white background and highlighted by the bright yellow/green triangles that dot the shirt. Furthermore, on Bellucci’s chest, adidas does good to melt the triangles into one another before the blue covers the shoulders. Tsonga was the only ATPer clad in the Roland Garros-branded adidas adiAce line. On the men, they produced a slim-fit polo with flattering color-blocking (not that Tsonga needs help in that department). And you know how we love a popped collar, so the quarter-zipped stand-up collar on the polo is a nice touch. The colorways: Intense Green with white and Medium Lead; Medium Lead with Intense Green and Ice Grey. On the women, they’ve used a maroon colorway on a scoop-neck dress with a pleated skirt. The accompanying wristband and warm-up jacket — accented with a neon (“Aero”) red — round out the collection. Also of note: a few graphic tees and a white, ruffled top for the ladies. See our picks below; browse (and buy!) everything here. What do you think of the adiAce goods? Buy: adidas Originals Stan Smith Printed T-Shirt, $46.16, asos.com. 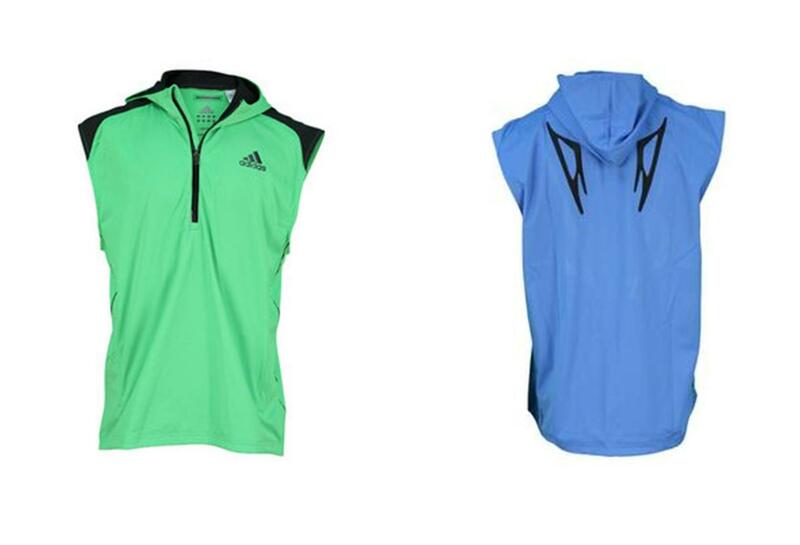 Buy: adidas Barricade Track Jacket; green and blue; $92.99; Tennis Express. Andy Roddick‘s strong start to 2011 — with deep runs into Brisbane, the Aussie Open, and Memphis — did nothing for him at Indian Wells and Miami, and it’s translated into more weak performances on clay. 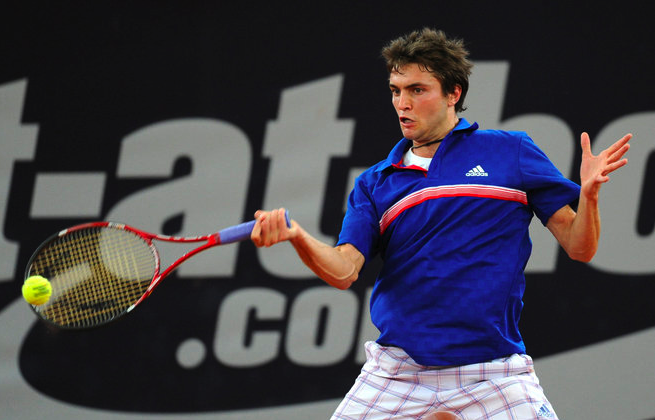 Last week’s flameout against Flavio Cipolla now sits alongside another first-round “L” against Gilles Simon, who took out the 12th seed 6-3, 6-3. Striped: The Spring 2011 Adipure line’s all about the collegiate look, putting these plain stripes on the Traditional Pattern Polo (in varying navy/green/white combo’ed colorways). There’s also some argyle and a faux cardigan. Our pick: The Traditional Cotton Tennis Polo — complete with a crest (img) — $42.99, tennisexpress.com. 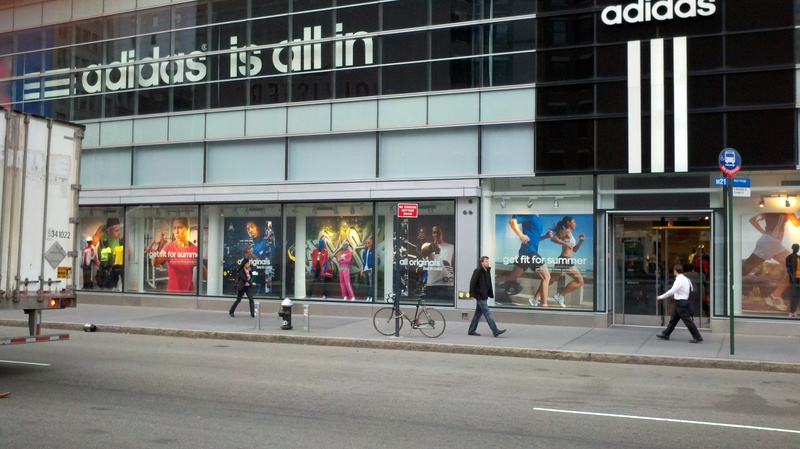 The rest: adidas Adipure Spring 2011. Look down: As hypnotizing as it is, look away from Muzz’s fuzz for a sec and check out his fun blue adidas polo, part of their Barricade group and exclusive to Andy. Loving the green detail in the placket. 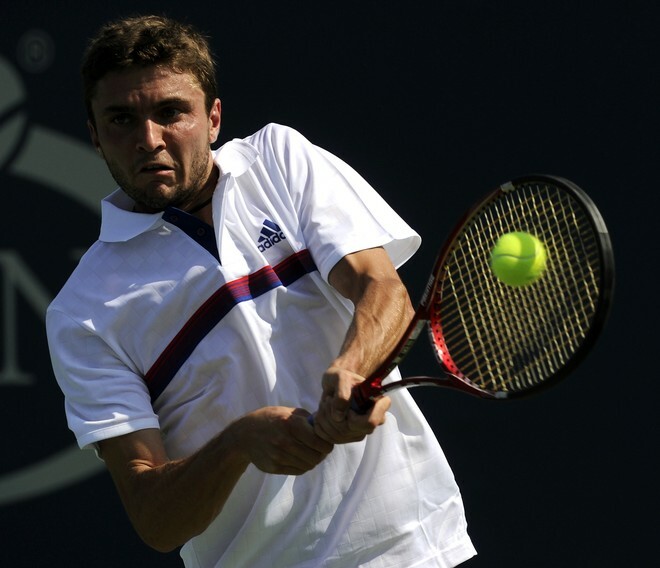 Buy: adidas Men`s Barricade Traditional Tennis Polo; $51.99; tennisexpress.com. 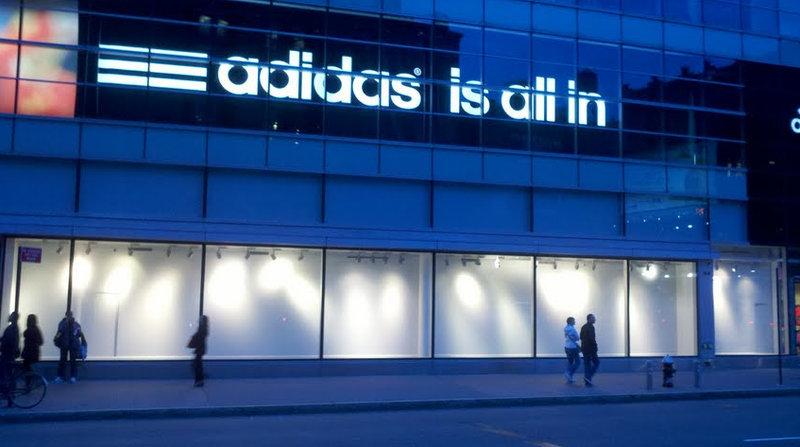 Summertime signage: We know you were curious about what the adidas store would launch off its blank canvas from earlier this week. Looks like they’re set for summertime, and if you can’t quite make out those faces, don’t worry — none of them are major athletes. Just models making the store look pretty. Juan Monaco‘s playing at this week’s combined Mutua Madrid Open, winning his first-rounder against Andrey Golubev 2-6, 6-2, 6-2. He’ll need to step it up if he wants to upset ninth seed Gael Monfils in the next round. They both share the same quarter as Andy Murray (though we think it’s Tomas Berdych‘s to lose). 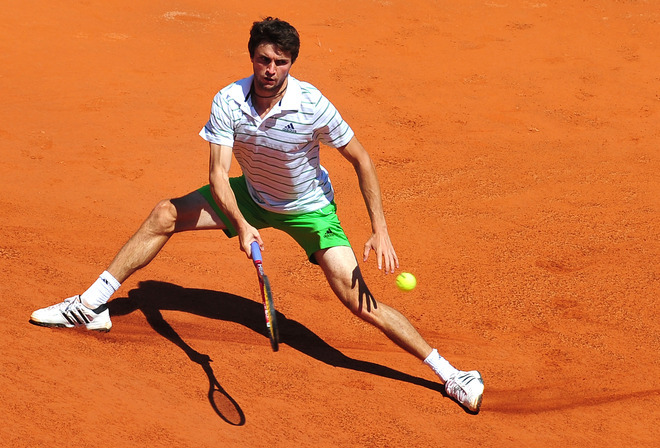 Browse: Mutua Madrid Open Draws. Taking pic(o)s: Some shots we took of Monaco earlier this year at Indian Wells. Anyone else ready to make this Donald Young vs. P-Mac story about Tim Smyczek instead? (Aside from Forty Deuce, we mean.) After all, Tim’s the guy who beat Young 6-7(4), 6-4, 6-3, 6-2 in that USTA six-man playoff in Boca West to nab a wildcard spot into Roland Garros this year. 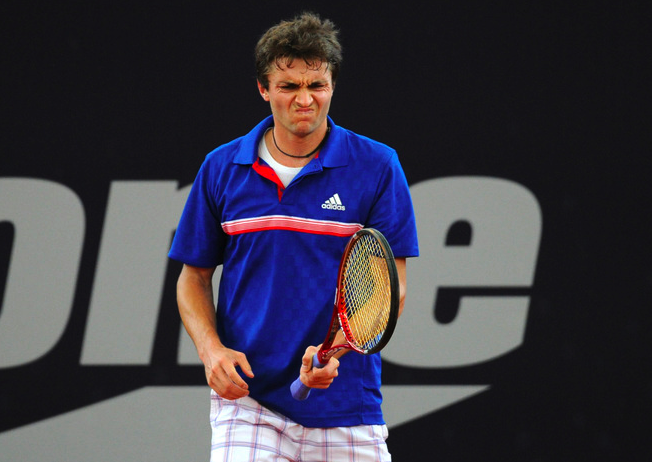 FYI: Smyczek’s never played the French. On the women’s side, top seed Irina Falconi beat third seed Julia Boserup 4-6, 7-6 (6), 6-3. More news: Dunlop announced today that they’re making Tim a part of their roster (though he’s been playing with their racquets even before the signing). His apparel and shoes are via adidas. Shirtless: Here’s Smyczek getting sun and practice at this year’s BNP Paribas Open at Indian Wells. On the other side of the net: Ryan Sweeting. Enjoy!